U.S. ARMY Deployable Rapid Assembly Shelters, D.R.A.S.H. The Dornsife Office of Pre-Health Advisement is bringing a new type of experiential learning to USC students. 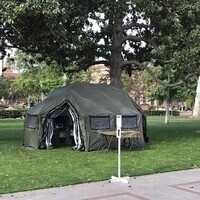 From 11:00am-2:00pm, on Tuesday, October 17th, the US Army Medical Department will bring a Deployable Rapid Assembly Shelters, D.R.A.S.H., to USC. What's a DRASH? Deployable Rapid Assembly Shelter. These are important shelters military personal use as shelters, as well as healthcare facilities. This mobile surgical tent will be placed on McCarthy Quad where students can tour, meet with Army personnel and ask in depth questions in their field of study, as well as learn about healthcare opportunities in the U.S. Army. This hands-on experience gives USC students an opportunity to gain valuable knowledge from soldiers that perform in their areas of specialty.